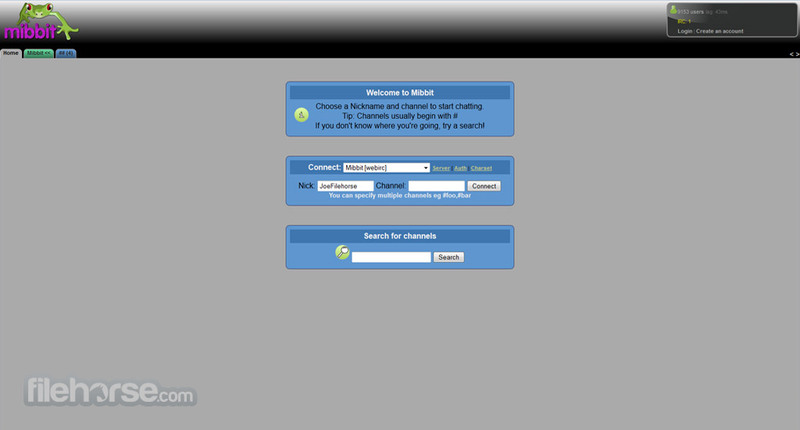 Mibbit is an online messaging service and online IRC client for modern web browsers that gives the users power to connect and manage their communications with Yahoo! Messenger, Internet Relay Chat (IRC), and Twitter. By using Mibbit, you can easily connect your favorite messaging service into one intuitive application that does not require you to install itself or other software onto your system. All modern browsers today support various scripting languages and plugins that enable smooth work of Mibbit. Easy-to-use online IRC client that can be embedded anywhere! Today, more than 25 years since the Finnish programmer JarkkoOikarinen managed to create first version of the popular Internet Relay Chat (IRC) protocol, more than half a million people uses this popular chat network at all times, making it one of the most popular chat networks in the world. Today, more than dozen popular programs are used to access this network and one of the most easiest and feature-full ways to do so is Mibbit. Mibbit is a online IRC client, made to work only in a web browser by taking full advantage from Ajax, HTML and JavaScipt programming languages. With support for both basic and some advanced features that you can’t find anywhere else (like integrated support for Yahoo! Messenger, Twitter, typing notifications, webirc protocol, integration with Google Translate, and much more), Mibbit represents one of the best programs that can be used as a replacement to the age-old mIRC. Read more if you want to find out more. Mibbit offers everyone the chance to connect to their favorite IRC networks (NetGamers, FirewirezNet, LinuxFire, ZTechNet, AndroidIRC, and many, many others…) with least amount of hassle and with tools that will even enable complete computing novices to take advantage from its basic and advanced tools. What will help them the most is the innovative user interface that does not require users to know complicated IRC text commands to manipulate their interface, features, connectivity and chat options. Among many notable features of Mibbit we have to mention excellent search feature for finding both users and chat rooms, embedding of YouTube videos and images, twitter integration, DOC and PDF viewer, support for skins, real time translation via Google Translation, and more. Mibbit is web based, but you don’t have to go to its website to take advantage from its great features. Anyone can install its widget on their website or blog that supports code embedding, enabling your site visitors to effortlessly join in the discussion in your own private chat room (the only notable feature that is missing from embedded client is inability to connect to more than one server). You can also use Mibbit via Chrome browser extension. All in all, if you are newcomer to the world of IRC, then Mibbit definitely represents one of the best ways to get acquainted with it, meet new friends and chat in an environment that still offers more flexibility and freedom than other modern chat networks (Google Talk, MSN, Facebook Chat, …). Interface of Mibbit offers minimal clutter that hides powerful tools if you scratch beneath its surface. With very nice green theme, you will have no problems to access all the features of this great webapp, and discover little touches that will make your IRC chat easy and fast (like for example, placing your mouse over a username in chat field to instantly see highlighted all his posts currently visible on screen). After only few minutes of working with Mibbit, both professionals and novices will feel like at home with it. Mibbit chat is accessible to everyone even without registering. Just pick a username and server, and that’s all you need to do to start chatting. By registering with valid email address you will get the ability to store your preferences, favorite channels, keep all channel histories, get more robust security support (SSL), configure your own aliases, get access to more filters, and be able to configure your theme (colors, skins, smileys and sounds). Without any doubt, if you are a newcomer to the world of IRC, Mibbit is the best chance to get to know it better, and most possibly, you will never even wish to move to more advanced and robust client ever again. We recommend Mibbit to everyone, especially site owners who would like to enrich their site with the powerful “one click” solution for real-time chat. 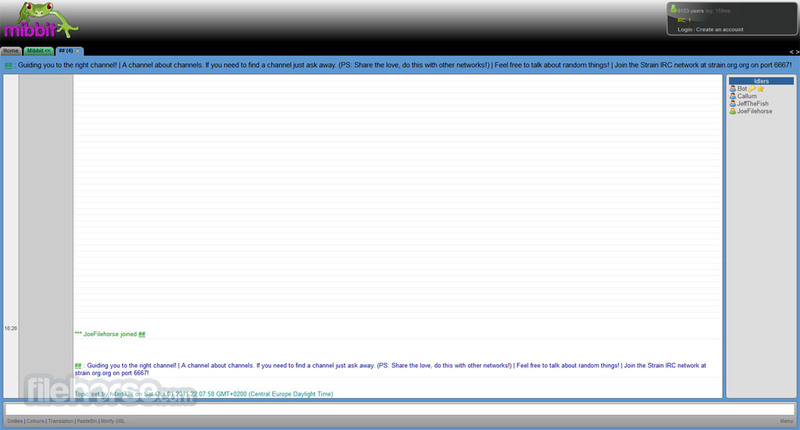 Amazing easy-to-use online IRC client!